Pop Culture Safari! : Pop Life: "Catastrophe," "Killing Eve," "Apollo 11"
Pop Life: "Catastrophe," "Killing Eve," "Apollo 11"
What I'm reading, watching, hearing, etc. "Catastrophe." That was way too quick. My wife and I buzzed through all six new season 3 episodes of this brilliant Amazon Prime series in just as many days. The show is a cringe comedy, but not one that generates uneasy laughter via unlikely situations. This show's situations and dialogue are all too real. Anyone who's been married for a while will recognize how real life will never let the ideal of marital bliss realize it's just a crock. The frustrations of child-rearing, the stress of career, the anguish of loss, annoying family and friends - it's the ability to get through all this crap together, and to recognize it's absurdity, is what successful marriage is truly all about. The comic chemistry, and writing, of co-stars Sharon Hogan and Rob Delaney is brilliant. As a couple, they never seem less than real - just a lot funnier and, frankly, meaner than most married folk. 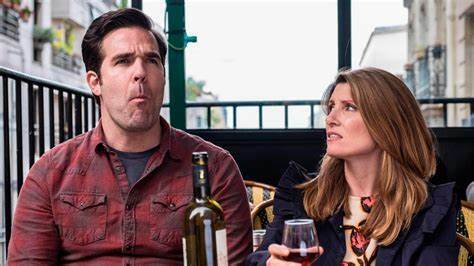 There are a few moments in this short season that fall to the level of "just plain comedy" and predictability, I'd say, but "Catastrophe" set it's bar very high and, overall, this is still one of the best shows running/streaming anywhere. The last episode of this run, which serves as a tribute of sorts to the late Carrie Fisher, who played Delaney's mother, is a heart breaker for all sorts of reasons - hard to watch, yet I wanted to see more and more. 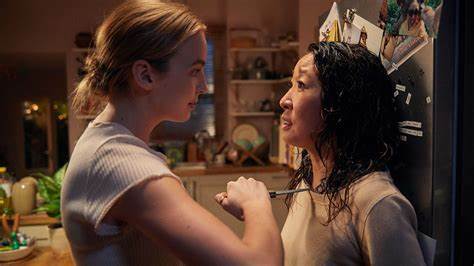 "Killing Eve." Before we buzzed all the way through "Catastrophe," we buzzed all the way through season 1 of this suspense-comedy starring the endearingly awesome Sandra Oh as an intelligence officer pursuing, and being pursued by, the terrifyingly awesome Jodie Comer as a French assassin. The two leads here are incredible. The show's suspense comes not from the situation they're placed in, but in trying to guess - usually unsuccessfully - how each character will respond. Both Eve (Oh) and Villanelle (Comer) are loose canons. Their motivations are unclear and unpredictable - not just to the view, but to the characters' themselves. They aren't quite sure, moment to moment, what they will do, or why. The dialogue is sharp - some of the funniest of seen/heard anywhere on screen in recent years. Season 2 starts April 7 on AMC/BBC America, but we're cord cutters, so hopefully it'll turn up on Hulu before too terribly long. "Apollo 11." Anyone fascinated by the Golden Age of space exploration and in love with the 1960s will eat this documentary up with the spoon. The footage, both terrestrial and lunar, is vividly restored and in bright color. Maybe you're old enough to remember the first moon landing (I'm not, I was 3) but you never saw it like this. There are no talking heads looking back 50 years. The narration comes from news coverage (including lots of the late, great Walter Cronkite) and NASA personnel. The action unfolds in real time and it's scary and exciting even though you know exactly what's going to happen. The bravery of Apollo's crew and the brilliance of NASA's engineers are inspiring, yet there's also an undercurrent of sadness knowing that America is no longer as united, as imaginative and as daring as it was when the space program was firing on all cylinders. 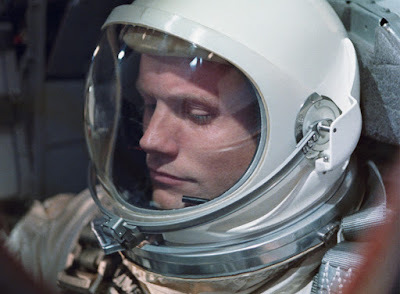 Side note: Seeing guys land on the moon was awesome, but so is seeing a young Johnny Carson in shades sauntering through the crowd watching the Apollo lift-off at Kennedy Space Center.